I've been playing STALKER again. Actually - I've gone through the game once more. This is the third time in the 3 months I've owned the game - which says quite a bit about the game itself (and I guess a little bit about me as well). STALKER has been on the way for what - 8 years? And for half that period, it has had the the label "Vaporware" stuck to it. 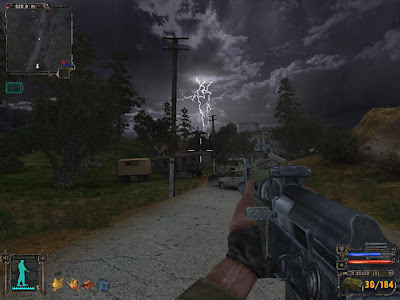 But in spring 2007, the Ukranian developer GSC Game World, came through. And they came through with what I personally think is the most amazing renewal of the FPS genre since HalfLife (1). 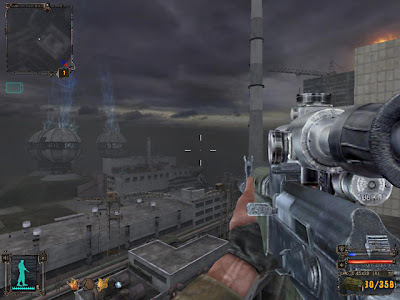 STALKER combines the traditional FPS elements, with a great storyline, non-linear gameplay (although there are major stories that has to be played), and a vast and varied environment to explore. In between the traditional FPS mayhem, it manages to squeeze in some nice RPG elements. You get to talk to all the NPC's, and you soon find out, that not only the major NPC's have quests. You can side with one faction, and battle another. You can earn goodies, money or befriend someone, by taking on side-missions of various magnitude. This setup reminds me a lot of the GTA series, although still very different. But it DOES work amazingly well. And it adds to the feel of a non-linear game. It was not untill this, my third run, that I felt I had "been down that road before" so to speak. 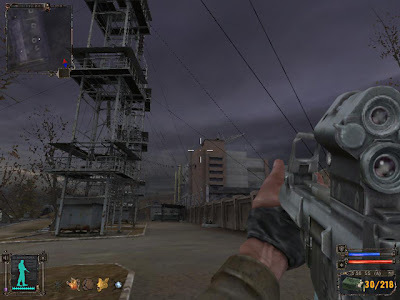 STALKER takes place in the area around Chernobyl, Russia. Chernobyl where the nuclear power plant had a meltdown in 1986 (and in the game story again in 1989). You're playing the role of the "marked one", struggling to uncover your own identity after a heavy amnesia. From interaction with NPC's, you slowly start to uncover what seems to be a large government plot. The environment is absolutely stunning, yet incredibly grim and depressing. Ranging from rural to urban, from sewers to industrial complexes - and then the vast open ranges, where you run into the occasional mutant dog/humanoid/something else, or just another group of STALKERS, singing coombaya at the campfire. It is said, that GSC took several research trips to the the contaminated zone around Chernobyl and Pripyat, during the development. And you certainly get the feeling that those trips were a good idea. Everything feels like it was put there for a reason - if not else then for the reason of creating the right atmosphere. It matches my idea of a post-apocalyptic scenery perfect. Unfortunately my computer does not quite run STALKER at the best settings, which means I had to cut back a bit on the eye candy. Even so, the mood of the game is just brilliant. And it spooks me a LOT more than DOOM 3 (which turned predictable after level 1) did. 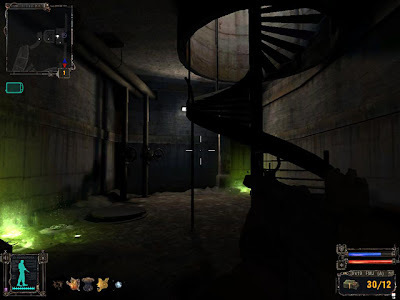 I'll be millimeters from a small seizure, when my girlfriend suddenly sneezes in the other room, while I'm crawling around in the sewers, looking for Strelok. The industrial areas are my absolute favourites. They're not advanced sci-fi, and even if there are some creative liberties, for the sake of the story, it is believeable for it's time - bit low-tech and very human. Just running around the Chernobyl NPP, and inside the sarcophagus is enough to give me goose bumps. And when I think of my friend in Vilnius, Lithuania, who's living about 50 kilometers from a nuclear power plant of the same type as Chernobyl, I'm glad I'm just playing a game. The AI of STALKER is quite impressive, and among the best I've yet encountered. Enemies will charge, evaluate, regroup (if in greater numbers), hide if outgunned, and wait for you to forget about them or till you get close enough for them to strike. Furthermore, the game world is never "dead" and just awaiting your interaction. 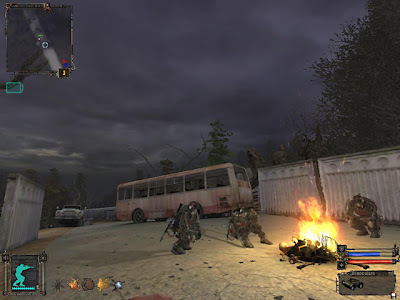 NPC's will interact among themselves, battle eachother and the mutated wild-life of the zone, or team up for a song around the campfire. You seldom get a one-hit-one-kill, and the weapons seem fairly to hard balanced. But you can protect yourself. Various protective suits (armour, radiation, chemical) will ensure safer passage through the Zone. In addition you can mount various "artifacts", created by the Zone's many anomalies, to your belt. These artifacts look like differently shaped (glowing, or bouncing) stones, and all have various protective capabilities. Most of them however also has sideeffects though. For instance the Droplet artifact will take -10 points of the hazardous radiation, but it will also lower your endurance with -18. So you'll be protected from higher radiation levels, but you'll only be able to run for a shorter period. The weapons are many. Mostly based on various rifles and guns. But grenades, grenade launchers, and RPG's are also available. Some of the weapons have been modified for better effect, and it's just small details like this, that really add to the mood. You get the feeling, that someone with great technical or mechanical knowledge, has tinkered with a weapon, to increase it's firing range. You'll also be able to fit a selection of scopes to selected weapons. 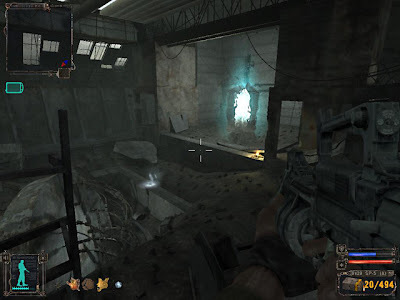 STALKER uses a detailed inventory system, similar to those of traditional RPG's. You'll have to take into consideration what you need for a certain mission, because you can only carry so much. Carry more, and it will affect your ability to run and jump, and ultimately you'll be too exhausted or too heavily loaded to walk at all. In your (permanent) stash, is also a PDA which functions as a map, diary and "notepad". It stores info from found PDA's, info about missions, the Zone and it's inhabitants (and oddities), etc. I've read a bit about bugs and issues with the game, but I've had no issues at all. Not one single crash, freeze, or odd behaviour. Maybe this happens more frequently with higher spec. machines running the "full monty". It seems though, that the recommended RAM specs of 1Gb is a bit too low. Some people report highly improves stability with 2Gb ram. 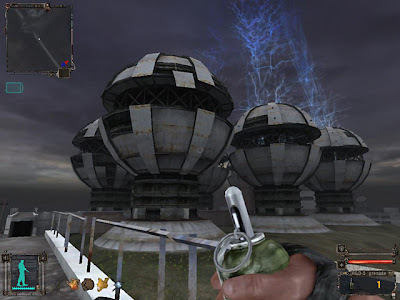 I think STALKER will definetely appeal to those who liked HalfLife. And it really goes to show, that you can create something worth the money, if your main priority is not technology, but story and gameplay. There's said to be 7 different endings to the game - 3 of these are "right". I've seen 2 wrongs and 1 right. The interresting part is, that depending on who you talk to, and whose lead you choose to follow, you may actually end up making a crucial decission - only halfway through the game. So pay attention, and listen to the word on the street. 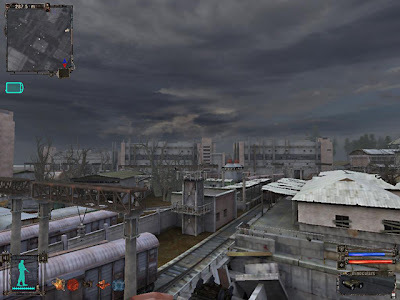 With STALKER you don't feel like you've been ripped off, after just 5 hours of playing. It has a high replay value, and is worth every penny. Read the blog of a young man, who was a kid in Pripyat, when the Chernobyl NPP blew up. 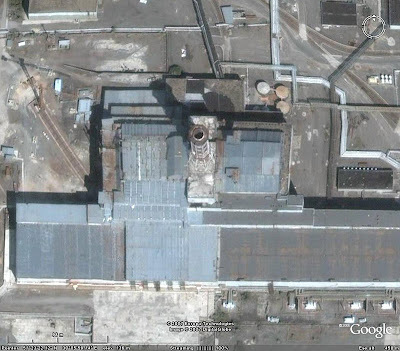 - just for reference : A google earth picture of Chernobyl NPP, with reactor number 4 encased in the sarcophagus. 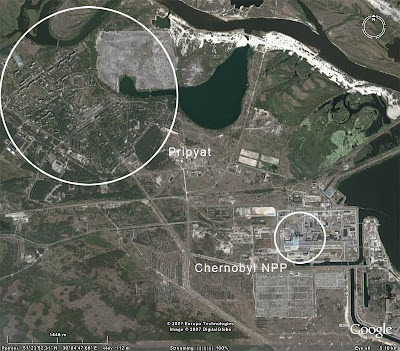 And just to put things in perspective - another google earth image, showing Pripyat and CNPP in relation to eachother. An area of 20-40 km's surrounding CNPP, will most likely never be inhabitable again, and the after effects of the radiation is still affecting animals, plants and humans. Indeed a sad and catastrophic event. And although it is 20 years ago, it should never be forgotten. Hopefully the efforts of GSC will help people remember. - and it is still a great game.